Yes, I do know you're going to have to look closely to see this one, as it's smaller than the oak leaf next to it. I had to look closely, too. This is the first new growth that I've seen in the woods around the cabin so far this spring. It's going to be a dog-toothed or yellow violet. The multi-colored leaves give it away. My second photo is still a mystery plant. 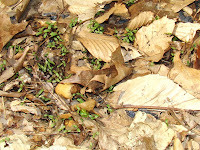 Those seedlings are tiny--notice the acorn next to them. The weather was warmer this weekend, and if I didn't stand in the wind or the shade, and if I kept moving, it almost felt warm. Still after winter, even a few days with that many caveats can't prevent new growth from starting, though it's still slow. Lower down the mountain I've already seen coltsfoot blooming--the plant looks exactly like a dandelion except it has no leaves. I can't quite count that yet, though, as it's not blooming up where I am, but I know it won't be long before I see that. Bird migration, or at least sightings of the small birds, was also a bit slow this March, likely because the month will end up being slightly cooler than average and quite a bit drier. I've yet to see blue-gray gnatcatchers or hear a towhee. The phoebe, killdeer and Red-winged blackbird remain my only true migrants to arrive and set up shop--and none of these three had far to travel to get here. It's the time of year when the old season is gone but the new season still hasn't picked up much steam. It won't take much, though. One spring rain followed by a day of sunny weather is about all it will take. This morning I learned I have not yet fully thrown off the trappings of winter. Oh, my heaviest jackets are back in the closet, and I no longer feel the winter’s deep chill. But mentally, I still haven’t shed the thought processes of winter—my instinctive winterthink, which I didn’t even realize I had. Before dawn today, Dog and I were walking, as we usually do, and we came to a spot we always have to cross. 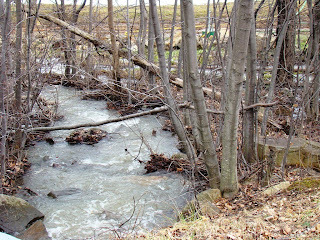 It’s a small area where water runs off from the ski slopes. This morning, I reached the edge of this wet area and automatically tested it with my toe before stepping on it, checking the slipperiness of the ice, before crossing. And that’s when I realized that I don’t need to do that anymore. There isn’t any ice. Perhaps now I’ll finally be able to put winter behind me for another year, back into my mental closet, somewhere near my winter jacket. Today’s photo was actually taken yesterday morning. Today’s morning is a grey and rainy one, as predicted by the forecasters as well as by the thickening clouds you can already see appearing in the photo. You can see a bit of the evershrinking snowpack on the mountain from the vantage point of one of the old snowmaking ponds. Happy spring! Update: Have you heard about Jonathan Rosen's new book The Life of the Skies? It's gotten great reviews, and it's on my "to read" list. The blog 10,000 Birds is giving away five copies of the book over the next few weeks. Check out 10,000 Birds for the rules. Maybe we could start a book club and all read it together. This is my disapproving face tree. The tree (and the face) look right into my bedroom, and I always thought the idea of that was hilarious. I wouldn't have thought to put this on my blog, except I've discovered that there are other bloggers and other face trees around. I got the idea from Teach Me About Birdwatching, where the blogger posted her own face tree, which isn't disapproving the way mine is. My own face tree has grown quite a bit since I moved to the cabin. The face is now several feet above his original vantagepoint. And the left "eye" isn't quite as visible or symmetrical as it was then. The right eye, nose and mouth are still pretty good, though. Soon this face will be disapproving into my second floor window. So maybe this is the start of something. Do you have a face tree--dispproving or otherwise? 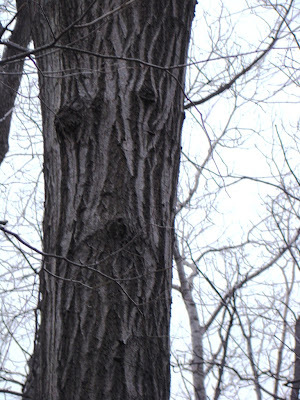 I'd kind of like to see a smiling face tree. It would be kind of novel after looking at this guy for all these years. Today’s photo is the start of my own little personal experiment. I took the photo behind the cabin this morning. It’s a view up the hill and to the south. Right now it’s a nice clear view, and I can see to the top of the rise. Once the leaves come out, my view will change quite a lot. I’m guessing that I won’t be able to see any further than the oak tree in the middle of the frame, and even that will be obscured up to about chest level by the forest understory. Actually, I want to try a couple of things with my little experiment, though I won’t bore my readers with every step of the process. I will likely take a couple of photos that show the in between stages of this view, as well. And I want to take photos in the other directions, too. This morning I marked the spot where I took this photo with a little ribbon, so I can be sure I’m standing in the same spot whenever I take the next one, which will probably be sometime in April. I expect that the spot won’t reach its fullest amount of obscurity until late June, perhaps even July. 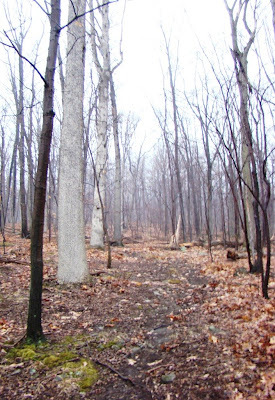 In winter with the snow cover on the ground, I forget just how many trees lay on the forest floor. 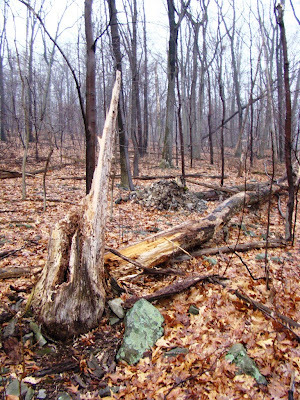 Sometimes it seems as if there are as many downed trees as there are standing ones. 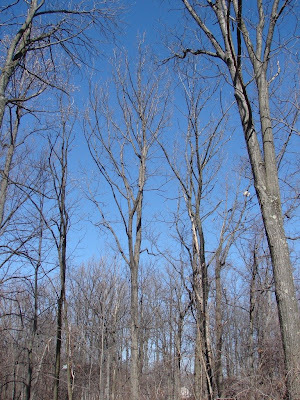 Most of the trees you see here, both on the ground and upright, are oaks. I have both red oak and white oak. I also have a nice collection of boulders here on the mountain—not as many as in, say, Devil’s Den in Gettysburg, but a good number. 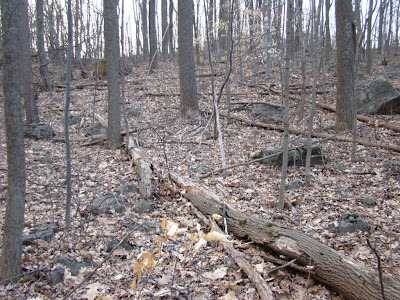 And there’s an area higher up on the mountain where there are as many rocks as Devil’s Den. Roundtop’s maintenance crew calls it "snake country." I’m not sure precisely why I’m starting this little experiment; perhaps it’s just so when I start whining about feeling a little closed in by the greenery that surrounds me, I’ll have some proof of what that looks like. These lovely woodpecker holes were made by one or more of the local pileated woodpeckers, those clownish-looking Woody Woodpecker types that are a cousin of the larger and scarily elusive Ivory-billed Woodpecker. Most woodpecker-drilled holes are far up in a tree, certainly too high up for me to reach. 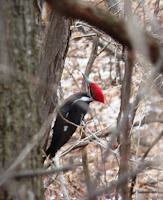 But pileated woodpeckers, indeed most northerly species of woodpeckers, drill their holes near the base of trees. And since this lovely work of woodpecker art is at the end of my driveway, my investigation of these holes was an easy prospect. I am somewhat ashamed to admit that these were the first woodpecker holes I’ve ever gotten up close and personal with. This seems as though it should have been something I did 30 years ago, but I didn’t (unless I’ve forgotten, which these days is a possibility). Oh, I know I’ve seen pileated woodpecker holes plenty of times, but I never actually took the time to stick my nose into one, as it were. My first impression of the holes was a surprise. These holes go deep into the tree, all the way into the very center of this now-dead oak tree, far deeper than I expected. 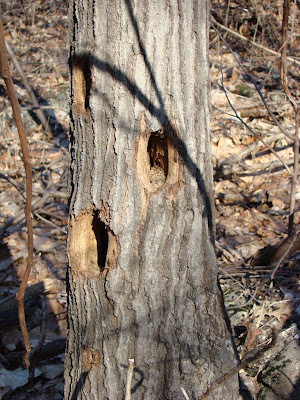 Another characteristic seen here, also typical of holes excavated by pileated woodpeckers, is the somewhat rectangular shape to the hole. Pileated woodpeckers are looking for ants when they are digging into these trees, though I wouldn’t have expected the ants to be this deep into the center of the tree. Obviously, I was wrong about that one. The inside and bottom of the hole is solid, not soft with sawdust, as I expected. Currently, I have several nearby trees that show a lot of attention from the pileated woodpeckers. Sometimes, the birds will drill so deeply into a tree that it falls. That’s a possibility with this tree, if the woodpeckers keep at it. It’s a good thing my electric lines are buried, I guess, though there is that one pileated-drilled tree near the cabin that I’d better keep a closer eye on. Last week I whined a bit about how the forest around me isn’t all that pretty right now. Spring hasn’t sprung, vegetatifully (new word!) speaking yet, so I am surrounded by winter’s bareness without snow to soften its appearance. This weekend, however, I discovered some of the benefit of that. The animals and birds are very active right now, and I can see them easily, far deeper into the forest than I will be able to see in another few weeks. My first visitor was a red-tailed hawk that glided down past the upstairs window, so close that I wondered if it had been sitting on the house roof. An adult bird, its wings and tail feathers were fully spread as it swooped down from above, then zig-zagged through the trees. The bird’s appearance immediately created an uproar in the forest. Crows came out of nowhere, and blue jays eating at my feeders immediately abandoned their feast and went on the alert. The Redtail landed in an oak at the edge of the lane, but not for long. Titmice soon joined the fray, and so many birds were now convening on the tree where the Redtail sat that I couldn’t count them all. The harried raptor soon left, and the local birds returned to whatever they were doing. Another visitor was a huge raccoon that appeared on my front deck. A bag of cat food tore as I was bringing it, and I was still inside taping up the torn bag when Baby Dog exploded with rage. I looked outside and saw the raccoon already at work on the spilled cat food, though I hadn’t left it unattended for more than 5 minutes. I opened the door, and the raccoon retreated up a tree just off the driveway. I went inside to get the camera but the raccoon took the opportunity to escape, galloping up the lane towards who knows where. All in all, it was a very active weekend around the cabin between the birds and the animals, I won’t whine anymore about the bare forest, when the antics that I see are better than anything on TV. My photo this morning proves that I do, at least occasionally, come off the mountain and go down into the valley. Sunday was a cloudless day, and the views across to the next valley were perfect. 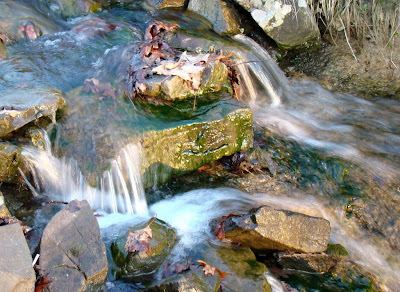 For the most part, I don’t care for photos of rushing water where the water looks blurred. I know that’s the style people go for now, but that’s not how water looks to me. I like my photos to look like what I saw at that moment. As it turns out, rushing water is a good metaphor for how my week has gone so far. I have been in a rush all week, looking ahead to Friday so I can switch gears and slow down in some quiet pool where nothing much happens. Well, maybe I’ll just have to be satisfied with slower water. Here on Roundtop, Grandmother Nature is having difficulty making a decision. Is it winter? Is it spring? Tonight, I will get snow, as though the vernal equinox was a sign, not of spring, but a terse reminder that winter is not yet dead. I feel as though I’m in the middle of some big seasonal fight, pulled towards spring one day, hurtled back into winter the next. Roundtop’s ski resort is now closed for the year, which means the mountain is quiet again, and I will have my weekends off for the first time since October. I am looking forward to having some time to spend outside, even if the weather is pretending it’s still winter. Hopefully, I won't have to rush. The 71st version of the carnival I and The Bird is now up at Clare and Leah's excellent site, The House and Other Arctic Musings. 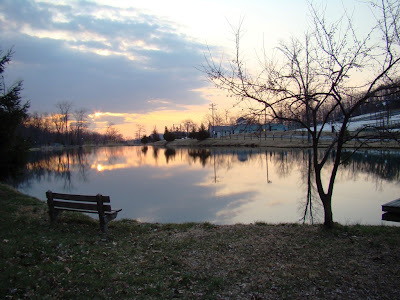 One of the posts from Roundtop Ruminations is among the the offerings this time around. And while I'm linking to other sites and posts, here's another that I found interesting on the Environmental News Network. Eco-Libris offers a way you can plant a tree for every book you read--to make up for using all that paper. The morning is a bit foggy here on Roundtop Mountain. I was supposed to have a lot of rain overnight, but fortunately that hasn't materialized yet. On my morning walk with Dog, I noticed a lot of downed trees and branches. Some were clearly damaged by the multiple ice storms this winter. Others, like this old stump, are already years old. It won't be long before the earth has reclaimed this tree, changing it back into the soil that supports new, as yet unsprouted, trees. The wood of this old tree crumbles when I touched it, turning into mulch in my hand. Dog and I have been noticing a lot of activity on our walks in the pre-dawn hours. And when I saw pre-dawn, I mean that not even a hint of light is visible in the east. Just this morning, Dog saw a rabbit that was quite close, likely not more than 15 feet away. As Dog is 60 lbs. heavy and can't let a rabbit just sit there while he walks by it, I had quite a struggle with him until the rabbit finally wised up and bounced away. But the rabbit wasn't the only thing we saw this morning. We also scared up a robin that was already awake and foraging on the ground. It's not uncommon for us to surprise a bird sleeping in a low branch of a tree and startle it. But this robin was already awake and looking for breakfast. The killdeer were announcing their everpresent annoyance to the entire world. I even heard a bluebird and much singing by the house finch that thrive down by the ski lodge. Spring peepers are peeping away now in earnest. The ground is soft and muddy. Spring is here now, no doubt about it. It's still early spring, with no sign yet of new vegetation, but it is spring. Let the season begin! This morning as I stepped outside to head to work, I heard the familiar sound of an Eastern Phoebe calling nearby, the first time this season I've heard that call. Naturally, I quickly scrambled for my birding records to see how today's first arrival date stacks up with other years, and I discovered that March 18 is profoundly average for a phoebe's first arrival in my neck of the woods. My fungus photo today is, I think, a cerrena unicolor fungus, a smaller, vaguely turkey tail-ish polypore (the shelf-life fungi). It pretty much covered the log you see it on here, and what wasn't covered by the fungus was covered by moss. This log is well on its way to being eaten by the forest. I now own three books on mushroom identification, the third a nice regional guide to mushrooms and fungus in my area. The other two are standard fields guides that cover North America. All are useful, but I need all three of them to make even a reasonably accurate identification of the neat fungus I'm seeing right now. And at this point, I don't think my semi-accurate identifications are going to improve all that much, for a couple of reasons. One reason is that there are a lot of mushroom and fungus species, and every fieldguide I've seen so far picks the commoner ones and uses photos that are most typical of that species. Even a guide with 300+ mushrooms and fungus is only hitting a fraction of what's really out here in the woods. 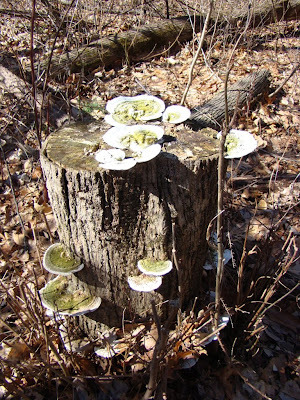 A second reason is that the identification experts report that the only way to accurately identify most/all/some of the fungus and mushrooms is to collect them, cut them in half and/or produce a spore print to check the color of the spores, which for the mushrooms that have them, is critical to their identification. Doing that destroys the plant, and my interest in knowing what the name of the plant is isn'ts extreme enough to want to kill them. So I will identify what I can and make guesses to the rest. I'll let them do their job of eating the forests and creating soil for more forests and leave it at that. Collection may be necessary but that's what they used to say about birds too, and we look with a degree of horror on that old practice now. So I'll just keep on photographing them and enjoying them where they are. For those of you who were hoping I'd soon be off my fungus obsession, my apologies. This weekend I set out into the woods with a most sincere intention of finding something to photograph that was not a fungus. My first thought was that I'd find a landscape angle that appealed to me, but the lighting wasn't great, the sky was overcast, and the forest is in that pre-spring brown that I am not at the moment finding appealing. In other words, that didn't work. Then I was taken by the texture of bark on different trees and tried a few bark photographs, which sounds like a good idea in principle but the results didn't match my image of how these photographs should look. And then, there it was. I was lost (and I don't mean in *that* sense). Before you knew it, I was taking more photos of fungus. Right in front of my toes while I was trying and failing to photograph bark was this magificent log with fungus all over it. Today, for a change, my photo is of one that I'm reasonably sure of the identification. It's a Turkey Tail! The latin name is trametes versicolor. Turkey Tail is one of the fungus that's known as a winter fungus, though you can find this common polypore in all seasons. 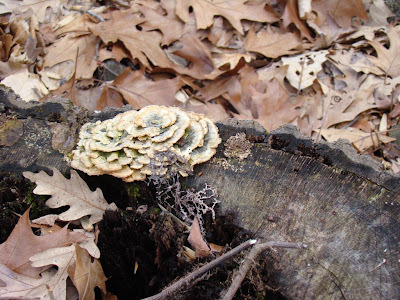 Turkey Tail was one of the first fungi to provide a modern drug for cancer treatment, which is just one more reason, as if readers of this blog will need one more, to preserve forests and their diversity. 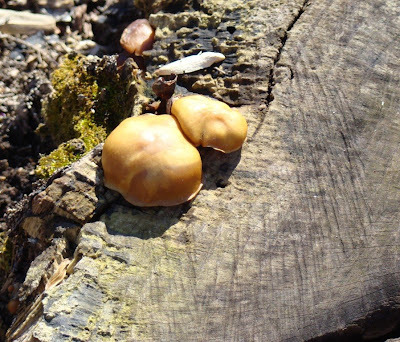 It's described as edible and healthful, but too tough to eat though it can be boiled for tea or soup stock. I should warn my readers that this is not the only fungus I found in this spot over the weekend, though I do promise that once I'm through posting this next batch of fungus, I will look for something else to photograph. Snow geese moved north last night over the cabin--snow geese and tundra swans and ducks, in flocks of hundreds and flocks of 3 to 5 or 10. Some flocks flew over the cabin, tiny V’s high above in the clear night sky. Some flocks I only heard as they flew to the east or west of me, only the sounds of honks and whistles to mark their passing. The swan and geese, even high, were easy to identify by their calls, amplified as the sound was by their sheer numbers. The small flocks of ducks I could not identify. Sometimes I’d hear the ghost of a sound, too faint or distorted by the distance, a single note—not enough. Last night was the first clear night that the temperature did not drop below freezing in I don’t know how long. Occasionally, during the winter on a cloudy or stormy night, the temperature has stayed near or slightly above freezing, but the clear nights were always cold—until tonight. And so the geese and swans and ducks moved north towards their breeding grounds. "I’m coming," they call, each in their own language, telling the north to be ready. They are on the way. I am mesmerized by this journey I am witness to. I stand outside, head craned to the heavens, until I can stand that way no more. And still they fly. I have stood outside the cabin on a starry night for more than hour, and it is past my bedtime. A meteor crosses the sky, bright and orange, a fireball almost, a small fireworks to acknowledge the wondrous migration, this annual pilgrimage. I wish I could stay outside longer, but I can’t. Inside again, I open my bedroom window, and I fall asleep to the sound of geese and swans and ducks heading north, a gift of enormous worth that humbles me even as it lulls me to sleep. Once again, my eye was taken with a fungus or mushroom I found in the forest, and once again I am frustrated with my inability to be confident of an identification. I think this is the early stage of the jack-o-lantern fungus, but I sure wouldn't bet a paycheck on it. If I'm right, this thing is pretty poisonous. In later stages of the jack-o-lantern's development, the rounded portion flattens out to some extent. I guess my only solution is to go back to the same spot and see how it looks on my next visit, not that that's a hardship assignment. In non-mushroom activity: spring continues to arrive, sneaking in on little birds wings at night. I'm always surprised, and by this time I probably shouldn't be, by the number of birds I see at night. Even when it's not a migration season, I commonly see or startle birds on my evening walks. For a while, I thought the lights at Roundtop confused the birds into thinking it wasn't night, but as the years have gone on, I've decided that it's the lights at Roundtop that allow me to see what the birds are doing during the dark hours. For example: last night around 9 p.m. I heard two house finches singing happily. I saw a small flock of Tundra swans inexplicably heading south--who knows what they were up to? A large flock of robins appeared out of the south, flew over the mountain and settled not far from my feet. I saw a few juncos and several unidentified sparrow-sized birds flitting around the bottom of several conifers. This morning the robins were all singing away, and spring's dawn chorus is getting louder and more prolonged with each morning that passes. But I think I'm going to give up on mushrooms for a while--at least until my new mushroom book arrives, the one my fantasies imagine will make identifications a snap! One excellent thing about walking in the forest this time of year is that I’m seeing things I don’t much notice during other times of the year. During April and May, my eyes and ears are consumed with finding and seeing those lovely little jewel birds, the warblers. In September and October, I’m more concerned with raptors. Winter, of course, has its own loveliness. Summer is green and flowery. But March? Right now I’m finding a lot of cool fungus and mushrooms. I’ve also discovered that I can’t ID many of them, despite currently owning 2 mushroom identification books (and have just ordered a third one) and visiting multiple and often very nice Web sites. In the process, I’ve discovered an entire subculture of nice people who are really, really in to mushroom identification and photography. However, even they can’t agree on identifications but seem to enjoy the arguments to no end. Who knew? So here I am with today’s photo, a nice grouping of fungus that I discovered on a recent evening walk. What is it? I’m not sure, but I’ve narrowed it down. At the moment I’m leaning toward something in the polypore family, and more particularly towards something called Mossy Maple. 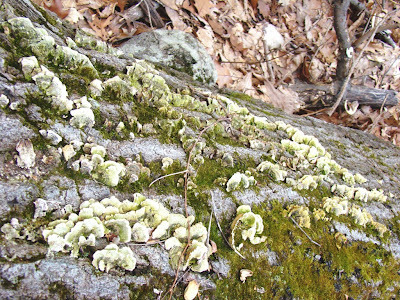 If I’m correct, the green color is really moss on the fungus and not a color of the fungus itself. The fungus is not on a maple stump, but I’m told this isn’t a dealbreaker by any means. Polypore fungus include most of the fungus that look like a shelf, as this one does. In fact, it’s this green color that makes the identification difficult. 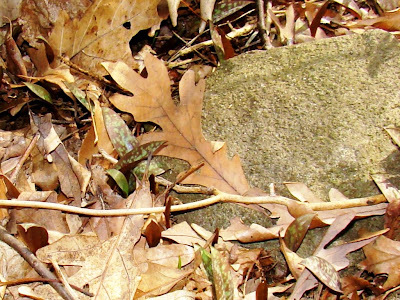 The other possible and seemingly likely choices, such as Turkey Tail or even False Turkey Tail, to name just a few, are not typically green towards their centers, ranging more to browns and reds. So for now my identification is a tentative one. Sometimes that happens and not only with fungus. Back in the day when I was a beginning birder I saw a lovely huge shorebird at Middle Creek Wildlife Management Area, and I spent 8 years considering my ID of it a tentative one. What I saw was a bird that wasn’t supposed to be where I saw it, so I assumed I must have identified it incorrectly. Years later I came across a book of bird sightings in the county that included a record of the bird I saw with the ID I originally made. And it was only then that I moved my ID from the tentative side to the certainty side of my records. But that’s a story for another day. This is how the forest around the cabin looks right now. The ice and snow disappeared Friday night and Saturday in the second of two rains last week. Some of the ice and snow lasted through the first rainstorm, but virtually none of it made it through the second. During the walk where I took this photo, I found a few patches of leftover snow under the leaves, but only under the leaves. It will be some time before I seen any hint of greenery--another month would be typical. And despite last week's rain, after that storm passed it turned chilly again, and tonight I might even see a bit more snow. 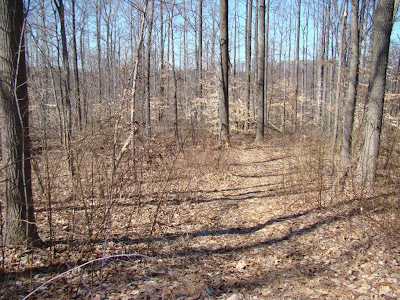 Still, it felt odd to walk in the woods and not see any snow. Not much snow fell around my cabin this year, but what fell stayed around, at least up on the mountain. So right now bare ground looks kind of novel to me. With the arrival of bare ground, I am already starting to see a few of the short distance migrant birds reappear on the mountain. Birds like flickers and mockingbirds, to name a few, disappear from the mountain during winter. They spend the winter in more protected areas at a lower altitude, but the instant the snow disappears or the first warm day arrrives, they reappear. They can't spend the winter more than a few miles away. On this walk alone, I saw 3 flickers and 2 mockingbirds, the first of the year. I've heard red-winged blackbird, too, but haven't seen them yet. This last bird apparently goes a little further than just down off the mountain somehwere, but it's not uncommon for them to winter in northern Maryland, so migration for them is nothing more than a morning's flight. The rest of the migrants will dribble in more slowly. Phoebe will likely be the first true migrant of the year, sometime later this month. Towhees can be nearly as early, too. Spring is on the way, one species at a time. Be on the lookout for aurora borealis tonight, even in the lower latitudes. A solar wind sparked auroras last night as far south as Michigan, and tonight's forecast is still strong for their possible appearance down here in the south. Spring has arrived at Roundtop, though I wonder if the birds and spring peepers are pushing the season just a tad too much. The nighttime temperatures are in the low- to mid-20’s. The daytime temperature barely hits 40, and the northwest wind is brutal. 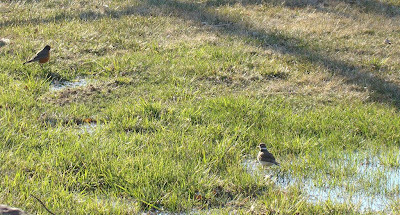 Despite that, I have killdeer and robins looking for breakfast in the same wet spot. Of course, it’s the only wet spot that wasn’t ice-covered this morning, so that has something to do with it. But still, yesterday, spring peepers were peeping at noon. I saw the first northern flickers of the season; in fact, I even saw three. The year-round residents are singing like crazy, so the woods are full of cardinals, Carolina wren, titmice and more, all singing away. Woodpeckers are starting to drum territory. All of this tells me it’s spring, no matter what the temperature is. This weekend, Dog and I walked down the mountain for a ways. We couldn’t go as far as I hoped, as the lower we went, the muddier it got. Still, it’s the first time in a while that we’ve been out when the ground wasn’t covered by snow or ice. That alone made the walk interesting. It’s a little like visiting some place new. The mountain is so different from one season to the next that when a new season takes hold, especially when the season takes hold abruptly, it almost doesn’t seem like the same place I was in yesterday. After three months of snow and ice, bare ground is quite the novelty. Dog and I walked over to the new pond, where we watched a small flock of probably the resident Canada geese call in a small flock of probably migrant geese. The resident geese heard the sounds of the other geese at least a full minute before I did. The locals were soon honking like crazy, and it wasn’t long before I spotted another flock of 30 or so geese just over the trees. The new geese acted as though they weren’t sure they wanted to set down. The once-perfectly v’eed group first fell into disarray, and instead of a "v" they became a clump of geese. They circled the pond, stalled overhead as some tentatively lost a few feet of altitude, while others flapped and moved a few feet to the north. They circled again. Finally, they set their wings and dropped slowly onto the pond, next to the first group, all of them honking in greeting. It’s still only very early spring, of course. Winter may well have some more punch to it, even deep into April. But the season is changing. Already I am thinking of this time as early spring instead of late winter. I find I enjoy the visible signs of seasonal change more than I like the depths of any one season. The cycle of change is deeply reassuring to me, on some primal level that I can’t fully explain. Life goes on. Seasons change. Maybe it really is as simply as that. Spring continues to push forward, a little bit more each day. This morning I heard red-winged blackbirds on the mountain. The robins are singing up a storm, too. Another two huge flocks of Canada geese honked over the cabin on their way north. It is early in the month for signs of spring to be so evident. Perhaps that is why the I’m noticing a few oddities around spring’s arrival. For example, the more typical pattern of Canada goose migration is to see dozens of flocks heading north within the space of just a day or two. This week, I have seen or heard a flock or two or no more than three each day on their northward flight. The flight isn’t as bunched into a day or two as it usually is. In a normal year, once it gets cold, it stays cold, and waterfowl are forced to move ever further southward to find open water and food. This year, winter’s cold spells didn’t last as long as usual before a warm day or two broke the cold. As a result, the ice never got too thick, in some spots the water never entirely froze shut, especially if it had any flow at all or was in a spot where waterfowl congregated. Likely, the geese short-hopped their way around as the weather warmed or cooled. They had a lot of choices for where they would find open water. In some years the geese congregate by the tens, if not the hundreds of thousands, in just a few spots, and most of them head north at the same time. One flock takes off, the others see that happen and before you know it, the second and third and fourth flocks are in the air too. This year the geese were not forced to bunch up at just a few sites with open water and so are spread out all over the place. As a result, they are spread out all over the place during their flights north, too. They may well be forced to bunch up somewhere north of me and wait for break-up, but not here. It’s only because Dog took off when I was trying to tie my shoe that I found this very cool fungus. Dog, who is overly-clever, saw my need to have two free hands to tie my shoe as an opportunity to wander off. And naturally, I couldn’t go after him with an untied shoe lace or I’d soon be stepping out of the shoe and into the mud. So I finished tying the lace and then went after Dog, who really didn’t go far. 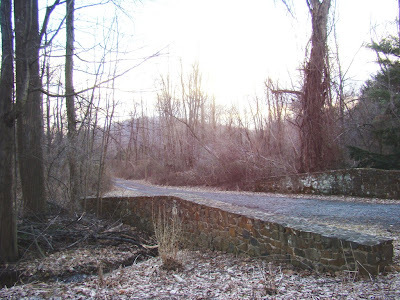 But, where he did go was into the rough, stony area in front of the cabin that’s filled with monkey vines and rocks of various sizes, not to mention downed trees and branches and holes where long-gone trees once stood. And that’s where I found this neat fungus. I think the fungus is one called yellow cup fungus, though I’m not certain, as this particular fungus is a bit past its prime. 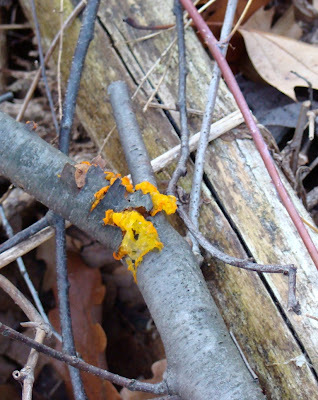 Other possibilities also have excellent names, like witches’ butter or orange fairy cup. 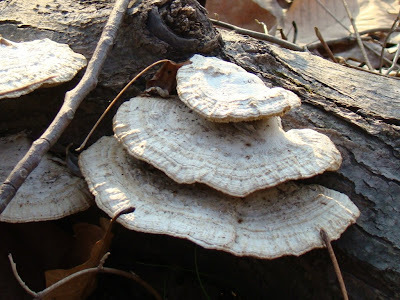 In fact, many of the fungus have excellent names, like orange peel, gray urn (it looks exactly like one), dead man’s fingers, elfin saddle or red pimple fungus. Spring is quite a bit in evidence around me right now, more so down off the mountain than up where I am. This morning I heard the first mockingbird up on the mountain, as well as several singing robins. Last night I was down off the mountain and actually heard spring peepers, though I think those guys were really pushing it. I had a hard frost last night, and the forecast is for overnight temperatures in the low 20’s. Down off the mountain I’ve also heard red-winged blackbird, another early arrival. 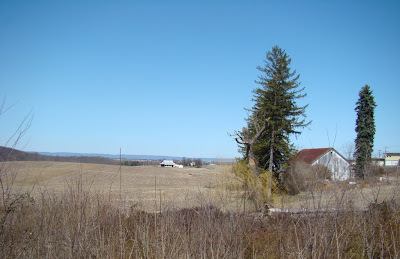 Spring takes longer to arrive up where I am, though I’m only 5-600 feet above the valley, but down there the habitat is more farmland than forest. That’s enough, apparently, to make the difference. Sorry for the late post this morning. I've been dealing with a bit of a flood. Living halfway up a mountain doesn't keep me safe from such things--especially as I live next to a ski resort that has, oops, had, 4 feet of snow on the slopes. 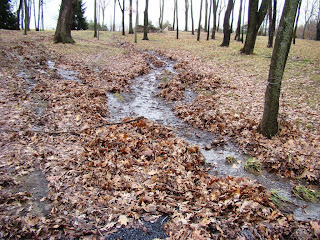 The ground was already saturated and muddy from the natural snow's melting before the rain started. Then last night I got something over an inch of rain. Add that to the snow on the mountain, and the result is a once a year (hopefully no more) prescription for a flooded basement. The rain stopped about 2 hours ago, but it's still coming in the basement. The ground water comes in through the casing of the well line. I currently have 2 sump pumps running, and the basement is down to about an inch deep--from 3-4-5 inches--but until the water stops running off t he mountain, the water will likely continue to come into the basement. Hopefully, that won't last much longer. I have one battery powered pump and one electric pump. I learned my lesson years ago when I had both a flooded basement and a power outage. After that, I bought a battery-powered pump to add to my collection. My first photo today is not a stream. It's an ordinary hill at the ski resort with a lot of water running down it. The ski slopes themselves are not as bad as I feared, but now instead of having 3-4 feet of snow, we have 1-3 feet of snow. That's a lot of water. 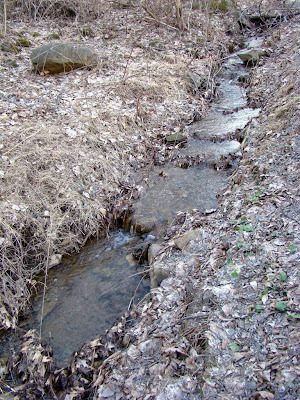 The second photo is a normally tiny seasonal stream that's at least 4-5 times its normal size. My lane is washed out this morning, too. It's the kind of thing that makes me glad of having 4-wheel drive. One thing I won't have to worry about is that once my flooded basement is done flooding, I won't have a river or a stream rise to worry about, and many people around here will have that concern well into Friday. The ground is muddy and saturated. Dog and I puddle-hopped on our walk this morning. The saturated ground is a bad thing considering the sky was red at sunrise, and the forecast is for heavy rain. The morning chorus of resident birds is louder and more enthusiastic each morning, and I suspect it won't be long until I hear spring's first phoebe. I will miss winter when it goes, but I am looking forward to having a little free time once the ski area closes. As winters are, this one had considerably less snow than is typical (and more ice). The winter saw warmer days than is typical here and there, but I suspect the average temperature will turn out to be, well, near average overall. This morning cardinals are singing, Carolina wrens are singing. Titmice and juncos are singing, too. Killdeer are screaming all around the mountain. Even I am starting to admit that it must be almost spring. Yesterday was the first day I actually felt it. The temperature was about 40, and although a few other days have also reached 40, yesterday was the first where 40 didn't have a chilly feel to it. Yesterday's 40 felt almost warm. Perhaps it's because much of the natural snow cover is now gone. Who knows why yesterday felt like spring when the same temperature just a week or so ago didn't? Daylight is lasting longer, the sun is brighter. Mud is everywhere. I'm even starting to see some open water. It won't last of course. After a balmy day today, tomorrow it rains and then it gets cold again. So this is nothing more than a teaser of spring. Still, it is the first taste of the new season, however brief it will turn out to be. I'm not going to put the snow shovel away just yet, though. But I am probably going to start doing something about my garden.